I’m back to writing book reviews after a hiatus devoted to promoting my work with great success. I had the pleasure of meeting Lisa Diaz Meyer and purchased her book All Roads Shattered. 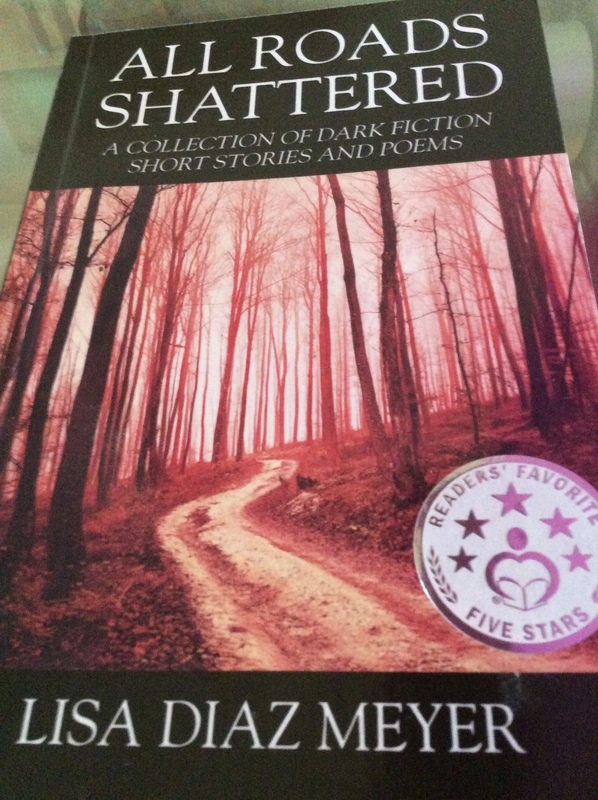 I wasn’t quite sure what to expect having been told this book is a combination of dark fiction short stories, multi-genre science fiction, and poems. What a pleasant surprise! I read the book in less than two days and could not put it down. The book, which has won a 5 Star Readers Favorite Award from New Apple Literary, is divided into parts: two sagas “Outposts III” and “People of Gods,” five multi-genre, dark fiction short stories and twelve macabre poems. Lisa describes herself as “a voice for the sad and lost, isolated and abandoned, desperate and different”…” (Lisa) relates to the odd, macabre, and funereal.” You might be afraid that these tales are extreme. To be honest, I thought yeah, I know people like this. People who are willing to sacrifice even their loved ones so their lives play out according to their own agendas. Lisa uses irony to repeat the same themes throughout: governments and the general population, as well as individuals within families, are in constant power plays for control; people cannot be trusted; what goes around comes around; the world is filled with shape- shifters, liars, manipulators; nothing is as it seems; always be suspicious to protect yourself and your loved ones; many people have horrible dark souls that even those closest to them are unaware. I especially enjoyed The Oddities , The Clearing , Dinner With Myles, and the Graveyard poem. Life has a way of sneaking up on you even when you’re looking.